I like to read. I track my reading habits on Goodreads, and I started using the Goodreads annual Reading Challenge a couple years ago. For 2018 I set out to read 24 books, but I blew past 24 books fairly quickly, so I changed my goal to 36 books. Down to the wire, I squeezed out the last book on December 31st. I knocked out an unusually high number of fictional works in 2018. As a huge fan the of the video game The Witcher 3: Wild Hunt, I wanted to read the books upon which the game was based. In a bit of a mad dash to get to 36 books for the year, I started binging the Harry Potter series over the Christmas holiday season. An excellent book for anyone who grew up believing in universal voting rights. You wouldn’t trust your mechanic to perform open heart surgery on you, because they are not qualified to do so. Why do you trust your equally unqualified fellow citizens to exercise voting power over you? Shouldn’t we leave voting to those qualified to vote? You probably find that a somewhat shocking idea. Read the book, and see how you feel about it then! Somewhat like “Against Democracy”, Jonah Goldberg’s latest is nother great read for any left-leaning neoliberal shill like myself. And by that I mean any left-leaning person might find themselves a bit challenged by the content. A great book that struck many chords. 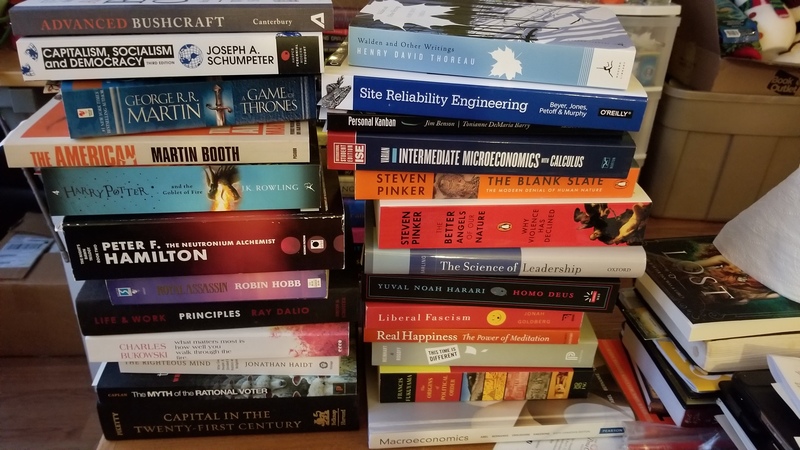 This was an optional but suggested reading for the 2nd year course I took in the Fall of 2018, “ECON 280 Population and Economic Change“. Am I ever glad I read it! While Sachs’ Millenium Villages Project has met some scrutiny, and the results of the MVP project are questionable, the book is still a powerful and positive message about the power of economic development. A mildly interesting aside: I could not shake the feeling that this book was very familiar. Had I read it before? A few chapters in I realized why it was familiar: Sachs’ work was attacked a number of times in Naomi Klein’s The Shock Doctrine, which I read back in 2006 - 2007. Very interesting to read the “other side” of the story and, on balance, I have to say Klein’s book was built on some serious cherry picking of Sachs’ history. That said, I’m inclined to go back and read The Shock Doctrine again. Not much to say … an excellent read. The follow-up book Homo Deus is in my to do pile. I’ve been reading a lot of politics lately. This is a really good read. It summarizes numerous important Charter cases. Critical to understanding the practical implications of the Charter here in Canada. I am neither a poet, nor much into poetry. However, on YouTube there is a great mashup of Bukowski’s “Roll the Dice” (read by Tom O’Bedlam) and a weigthlifting insirational video featuring Donny Shankle, former member of the US Weightlifting Team. I bought some of Bukowski’s books as a direct result of that video! One of the better mindfulness meditation books I have read. Almost completely woo-free, short “chapters” discussing specific points, and includes exercises to assist your practice. I’m a big Tyler Cowan fan and this is a wonderful “positive messages” book about economic growth, morality, rights and obligations. Mildly interesting aside: This book comes from Stripe Press, and they produce a very small number of books on progressive topics in economics and technology. I did not know this until after I had received my copy, but Stripe Press was created by Stripe, the payments company. I’m an even bigger Hitchens fan than I am a Cowan fan. There is no finer a wordsmith than Christopher Hitchens. His early death is a loss for all of us. Amongst this collection of essays, my favourites are those politically oriented, but his book reviews are also very interesting. I read a ton but I am not really up to speed on “literature”, contemporary or classical. Hitchens’ book reviews provide a lot of fodder for future reading. Probably my favourite read of the year. With my Daughter in her 3rd year and as a part-time undergrad myself, this was particularly on point. A terrible book on mindfulness, full of woo and little to no practical value. I have no idea how this became a NYT best seller. It is not an instructional book. At best it surveys the various bushcraft skills that should prove useful to you should you need them. You will need to look elsewhere if you actually want to learn those skills. My old Scout books were much better. Everything else … all good, all recommended, just not as noteworthy as those mentioned above.